Coming back from holiday I was dreading weigh-in yesterday so discovering I had only put on one pound was a relief. And as I'd only lost one pound since starting five weeks ago I'm back to the beginning again. But I had a very good holiday, eating lots of buffet breakfast and dinner, and having ice cream for lunch so mustn't grumble. I think that was my wake-up call. From then on I tried to resist cheese and bread - not entirely successfully - and generally tried to be more sensible, while not depriving myself at any point. And the fact that I only put on a pound suggests this was a good move. 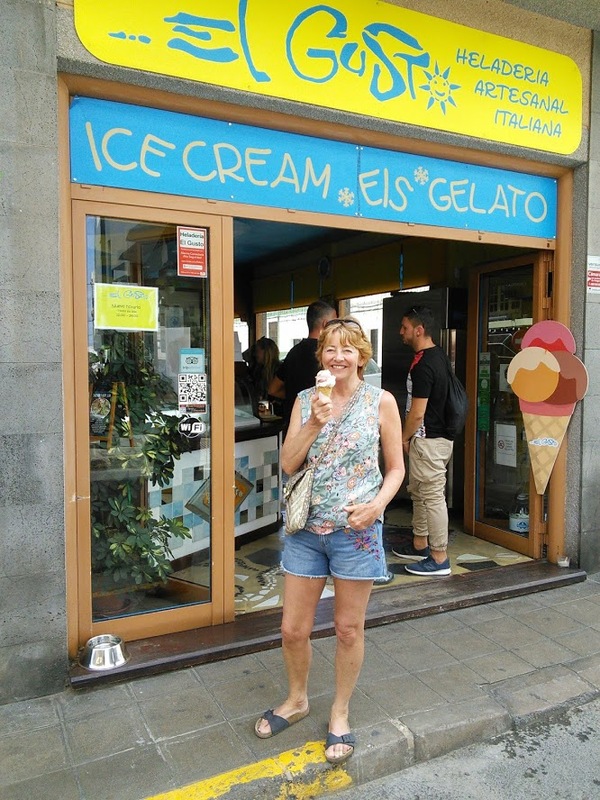 We had virtually no exercise on holiday - apart from walking to the ice cream shop - so I'm trying to get back into that again now. Will be going to gentle fitness as usual tomorrow and yesterday I did my first zumba class. Definite disadvantage not being able to tell right from left quickly but I feel more at home than I did with the boxercise so I shall try to persevere. I have even shopped sensibly this week and tried to plan meals in advance. (Polishes her halo.) But Elder Son and family will be here at the weekend for a few days so eating might be haywire then. Just found this post that I thought I'd already posted but had, apparently, left in Draft. So I'm not sure whether this will be in the right chronological order. Diet has gone to pot this week. Son-in-law's 40th birthday on Wednesday meant creamy pavlova followed by feta and spinach pie. Then yesterday,I had ice cream with a friend in Verdi's. A big hazelnut basket sundae. On Sunday it's Granddaughter3's christening so there will be more food and cake. Seriously? Like I'm going to diet on holiday? Stayed the same and that is fine by me as I had a really bad - or good depending how you look at it - week with a birthday celebration, ice cream with a friend, and a christening lunch party. Also I've not started zumba yet as I was poorly last week and decided not to bother going last night as I'm on holiday next week. So I will definitely start the Monday I return, which is about 8th April I think. The hotel has a gym. It also has a lovely relaxing spa and sunbeds. I think he decided against. Also found out that, as I'm on the countdown programme, I can't have next week off i.e. I still have to pay for it. Lost one pound. Not amazing but at least my weight went down. My plan to go to zumba last night was abandoned because the cold I was fighting off a couple of weeks ago - and which I thought had gone - came back and I felt pathetic. Overnight I've gone from sniffle to sore throat to tickly cough. Onward and upwards - or hopefully downwards. 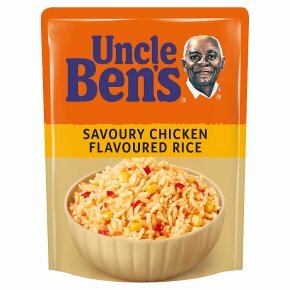 Just how special is Uncle Ben's rice? Breakfast and dinner times are fine on Slimming World but I struggle at lunchtimes, trying to think of things to have that isn't salad. Chilli beetroot and tomatoes are my go to and, while I very much enjoy them, there is a limit how much one can eat. Or how often. 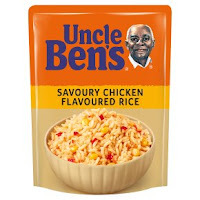 So browsing in Sainsburys last time I picked up a packet of Uncle Ben's Special Savoury Chicken Flavoured Rice. It seemed like a quick option. Dug it out of the cupboard today and checked the number of syns. Three. So not too bad. I heated it up and before I'd tasted it I was put off by the smell. Now I do have a nose problem so it might not have been entirely the fault of the rice so I took a taste. Oh yuck. Seriously? So that's three syns I've saved. Although I still haven't solved the lunchtime problem. We're having baked potatoes for dinner so I don't really want one now as well. Baked beans? But what sort of speed food (basically most fruit and veg except potato) do you have with baked beans? Uck, I can still smell it and I'm in a different room. Weigh-in tonight so perhaps I'll just eat fruit for lunch. Can't decide if it's a victory or a defeat.Victory in that I'm hoping to take control of my eating again; defeat because I can't do it without some sort of outside help. So starting weight (in clothes): 10 st.
Target weight (in clothes): 9 st.
On the plus side, after two weeks off, I'm back in gentle fitness. I would have been in boxercise tonight as well but my partner can't make it. Realistically I think boxercise is too much for me. My partner, though she's young, has all sorts of joint problems following a very serious accident a number of years ago, so we're both happy to potter along at no great speed, but when I thought about going on my own tonight I realised what a burden I would be to any other partner. I have investigated (just now) and I'm going to try out a zumba class next Monday evening. I'm writing that on here to keep me to it. I love music and dancing and I think the class will be a better range of ages and abilities than the high-powered boxing group. And not as professional looking as this group I hope. If all else fails apparently there is a zumba gold option - for old people - available too. P.S. For the first time ever today my hairdresser gave me biscuits with my cup of tea. I didn't eat them. Now normally on a Tuesday morning Husband gets up and weighs before I go into the bathroom and he leaves the scales out for me. This morning, he forgot to weigh so the bathroom floor was empty of scales. Next week is soon enough. I am back in gentle fitness class now and this Thursday I'm starting ... wait for it ... boxercise.